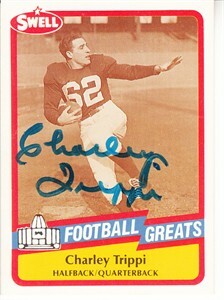 1989 Swell Football Greats Pro Football Hall of Fame card autographed in blue marker by the versatile Charley Trippi. With certificate of authenticity from AutographsForSale.com. ONLY ONE AVAILABLE FOR SALE.